The bins from Recycle for Missions have all been placed. To find a drop off near you, call the Depot. WARSAW — KC Recycling Depot Director Tom Ganser continues to make small improvements to the depot’s building and programs. This month, Ganser has begun converting light fixtures from T12 ballasts to LED equivalents as bulbs and ballasts fail. So far eight fixtures in the board room have been replaced. The new LED bulbs use 71 percent less energy and have an expected life of 50,000 hours. Ganser has also taken quotes to have the warehouse floor repaired and resurfaced. This project will cost around $3.25 per square foot, totaling $5,382. Ganser also talked to the board about shelving and space adjustments planned for the Depot’s warehouse. Aside from facility improvements, Recycle for Missions bins have now been placed at the rest of the drop-off locations across the county, excluding Milford which has a bin provided by a local church. 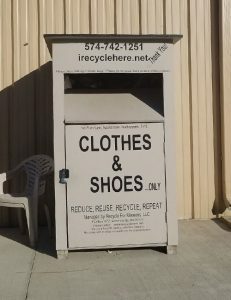 The recycling company accepts clothing and shoes. Around 2,900 pounds were collected in both August and September. There is a Recycle for Missions bin behind the Depot. For other locations, contact the Depot at (574) 372-3087. Claims were approved in the amount of $27,189.30. Borden has replaced tags on containers stating what can and cannot be dropped off. Ganser informed the board that a piece of computer equipment was stolen last month. No police report was filed. Board member Bob Conley implied Ganser should complete a police report.